Miss Grand International has been growing in popularity very fast in many countries. A good example is Japan, a nation which has its exclusive pageant to elect Miss Grand Japan. The contest took place last night and the winner was the very lovely Erika Tsuji. Mr. Nawat Itsaragrisil President of Miss Grand International Org., Eriko Yoshii National Director of Miss Grand Japan Org. 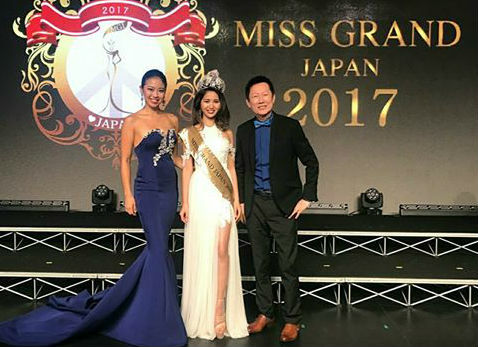 and the newly crowned Miss Grand Japan 2017 Erika Tsuji, after the crowning moment of Miss Grand Japan 2017 - cortesy of Miss Grand International. She will now get ready to compete in Miss Grand International 2017, on October 25th, in Phu Quoc, Vietnam. GB Opinion: Erika looks very cute and good easily pull a good result for Japan. In 4 years competing in Miss Grand International, Japan placed twice among the quarter or semi finalists (50%).